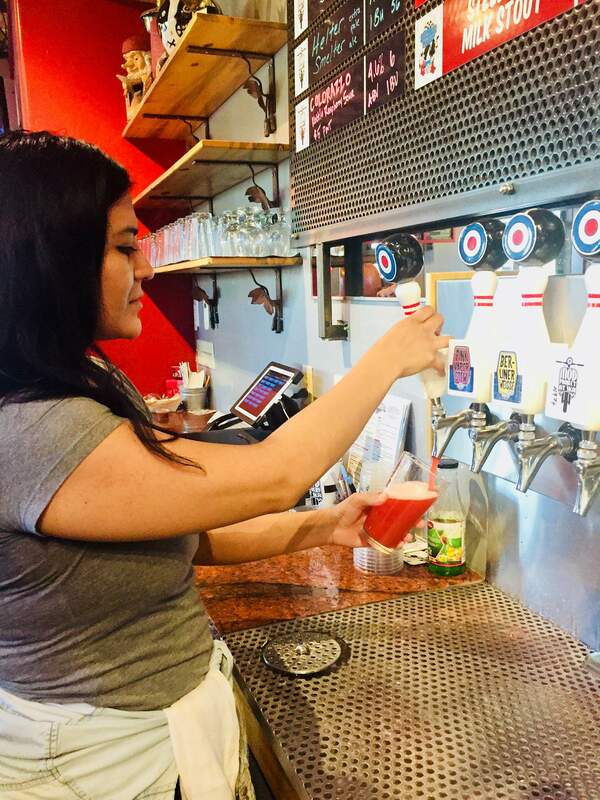 Nicole Gonzalez of Ska Brewing pulls a pint of the Colorazzo Raspberry Ale on Friday night. The brewery tapped the special beer and donated part of the proceeds of each pint to the Community Emergency Relief Fund to help those affected by the 416 Fire. The fundraiser will continue until the Colorazzo beer runs out. Since the 416 Fire broke out last week, Durangoans have been looking for any way they can to help firefighters, evacuees, businesses and those who are out of a job. Briggen Wrinkle, executive director of the Community Foundation Serving Southwest Colorado, said community leaders are collaborating to help these various groups. She also offers advice. Wrinkle said firefighters are being taken care of and, at this point, do not need donations of any sort. State and federal agencies provide what they need. But she said they appreciate community gratitude. She encourages residents and business owners to thank firefighters when they see them, to create thank-you signs to hang in business windows or to stand with the signs on a street corner during peak drive time. A collaboration of community leaders is specifically focusing on how to help people who are out of a job because of the fire and how to help businesses that rely on tourist dollars. “This collaborative is working on a website with resources and ways to make connections between what people need and what people can give,” Wrinkle said. For displaced employees, the Community Foundation is accepting monetary donations to the Community Emergency Relief Fund, which is used for broad-based community emergencies in Southwest Colorado. Wrinkle said the goal of Phase 1 is to raise $500,000 to help the estimated 500 to 750 people in La Plata and San Juan counties who have an immediate need for food, transportation and shelter. An advisory committee will work with government agencies and local businesses to determine how the money is distributed. Wrinkle said local businesses also need help, particularly because of a potential decrease in tourism. She encourages residents to patronize them. The Colorado Department of Local Affairs will open a disaster assistance center to provide job referral services, insurance claim advice, housing options and mental health resources from local agencies. Organizations include the Community Foundation, Region 9 Economic Development District, Durango Food Bank, Workforce Center, Durango Tourism Office, San Juan Basin Public Health, La Plata County Department of Human Services, Axis Health, Family Center, Manna Soup Kitchen and the Red Cross. The center will be at the La Plata County Fairgrounds, 2500 Main Ave., and will be open from 9 a.m. to 1 p.m. Monday and Tuesday. To donate to the Community Emergency Relief Fund, mail a check to The Community Foundation, P.O. Box 1673, Durango, CO 81301 or donate online at www.swcommunityfoundation.org. There also will be a collection table at the Durango Farmers Market on Saturday. The market is open from 8 a.m. to noon at First National Bank of Durango, 259 W. Ninth St.
Breakfast food (cereal, pancake mix, etc. )Fruit and applesauceCanned pasta and beansPeanut butter, jelly, honeyBoxed dinners, such as Hamburger Helper and macaroni and cheese Trail mix, nuts, jerkyLaundry soapPersonal hygiene itemsBaby/wet wipesMonetary donations are also accepted. Donations are tax-deductible. Contact the food bank at (970) 375-2672 or email durangofoodbank@durango.net. Donations can be dropped off Saturday at Walmart, 1155 South Camino del Rio. The Durango Farmers Market will also collect food Saturday to give to the food bank. Evacuees can pick up food from the food bank, 194 Bodo Drive, Suite C. Regular operating hours are from 10 a.m. to 3 p.m. Tuesday through Thursday and from 9 a.m. to noon Fridays. Socks for firefightersSeasons restaurant, 764 Main Ave., is hosting a “Sock it to Me” donation program and will be accepting over-the-calf wool socks, cotton bandannas, ChapStick and protein bars at the restaurant during regular business hours, 11:30 a.m. to 2 p.m. and 4 to 10 p.m.